Prosecco wines? 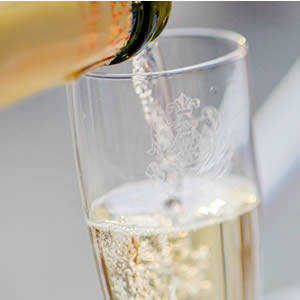 Order Prosecco wines online easy and safely! Le Connaisseur runs a wide range of Prosecco wines, including Prosecco of Val d'Oca, Follador, Scavi & Ray, Franciacorta Castel Faglia, Eugenio Collavini, Bolla, Villa Sandi and Mionetto. If you are looking for a Prosecco that is not on our website please contact us. Prosecco is an Italian white or rosé wine. Prosecco controlled designation of origin can be Spumante or Frizzante. The name is derived from the village of Prosecco near Trieste. Spumante is an Italian name for sparkling wine. Spumante indicates that a wine is sparkling. Frizzante means that a wine is semi-sparkling. The dividing line is at 3 bar: everything up to and including 3 bar pressure in the bottle is frizzante, everything with more than 3 bar pressure is called spumante. The difference is generally determined by the period of second fermentation. A short second fermentation (often less than a month) produces a lighter bubble: frizzante. A longer second fermentation a stronger bubble: Spumante.